Whenever I explore the music of a foreign country, I always start off with something I am slightly familiar with. When I went to Quebec, my first music purchase was of a singer named Meggie Lagace, who sounds a lot like Kelly Clarkson. By the end of the trip, I was listening to a 50 year anthology of music from Quebec, which ran the gamut from folk songs to rock and roll. In New York, I always ask taxi drivers about music from back home. That has given me some good leads. I also ask them about music that I have already heard. Sometimes you have to be careful though. Once I heard a Trinidadian cashier speaking in Hindi. I asked her about my favourite Indian pop music group called Silk Route. When I rattled off the titles of some of the songs, she started laughing. When I asked her what the song titles meant, she said "I'm not telling you." I gathered that some of the titles were terms of endearment that are not commonly welcomed from middle aged married men in a fruit store. Silk Route was one of the "bridge groups" for me. It sort of reminds me of Cat Stevens before he became a Muslim. What I like about the vocals is that they are in Hindi and not English. When you listen to Silk Route, you can understand why an Indian accent sounds the way it does, you can feel the texture of words and how they shape English pronunciation. Oddly enough, it is English that unites India. It was a language of colonial administration that was equidistant from all of the contending major languages of India. India is an amazing country. Some of the things that fascinate me about it are as follows. One thing that surprised me to hear about India is how loosely its various states are associated. In many ways, the European Union is more seamless. There are, for instance customs stations between Indian states that are as daunting as international borders. There is a program of affirmative action in India, where jobs and university admissions are set aside for the lowest castes. Resentment toward this has contributed to the rise of the right wing Bharatia Janata Party (BJP), although other economic issues have made that party appealing, such as the stifling government regulation that inhibited India's economic growth for so many years after its independence. India has one of the largest Muslim populations in the world,almost 150 million people out of its population of 1.1 billion. The first Converts to Christianity were in India. It is said that an apostel of Jesus known as Thomas set sail for India before the year 100 of the common era. I spoke to a Hindu nationalist who told me that Indian Christianity was actually an offshoot of Hinduism in terms of its ritual observances. I am sure that there are other interesting conflicts of historical narratives among India's ethnic groups. Some untouchables and other lower cast Indians are attracted to Christianity and Islam, which do not incorporate caste into their respective theologies. There are Jews and Zoroastrians in India whose roots stretch back into antiquity. There are some Jews who are descended from Iraqi immigrants. Others trace their ancestry back to the time of the destruction of the second temple, the Bet HaMikdash. There are Jews in the Northern Indian State of Mizaram who are thank G-d returning to the Jewish people. Some have returned to Judaism and to Israel. One of my favourite Indian writers is Rabindranath Tagore, who won the Nobel Prize for Literature in 1914. The language in which he wrote was Bengali, the language of Bangla Desh. It should be remembered that British India was composed of Bangla Desh, Pakistan and modern India. Some interesting quotations from Rabindranath Tagore are as follows. The following is a quote from Tagore's Gitanjali. Having lived in different places and felt homesickness in my youth, it resonates with the wisdom of old age and years of moving from place to place. Thou hast made me known to friends whom I knew not. Thou hast given me seats in homes not my own. Thou hast brought the distant near and made a brother of the stranger. I am uneasy at heart when I have to leave my accustomed shelter; I forget that there abides the old in the new, and that there also thou abidest. Through birth and death, in this world or in others, wherever thou leadest me it is thou, the same, the one companion of my endless life who ever linkest my heart with bonds of joy to the unfamiliar. When one knows thee, then alien there is none, then no door is shut. Oh, grant me my prayer that I may never lose the bliss of the touch of the one in the play of many. The music of India always reminds me of its amazing vastness and diversity. The manner in which technology has brought the world closer together has done this with India as well. For this I am most grateful. 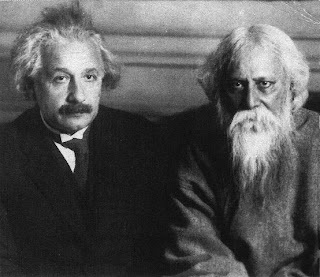 The picture at the top of this article is of Rabindranath Tagore and Albert Einstein.